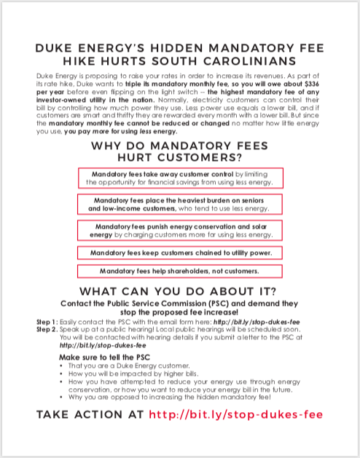 Update on March 29, 2019: After the blog post below was published and following overwhelming opposition to the proposed fee hike at public hearings, Duke Energy agreed to partially scale back their fee hike proposal. Instead of tripling the mandatory monthly fee, as their original proposal sought to do, Duke’s updated proposal would increase the monthly fee by 30-44%. However, even this lesser fee hike may force customers to pay more than their fair share to just connect to the electric grid. The numbers in the first paragraph of this blog post and on the attached fact sheet are no longer current, given the updated proposal, but the rest of the article about why mandatory fees hurt customers are concerns we continue to have even with the scaled back fee hike proposal. You can learn more about the updated proposal in our op-ed in the Florence Morning News here. Duke Energy has proposed a bill hike for its South Carolina customers that is unjustified, inequitable, and bad for consumers. 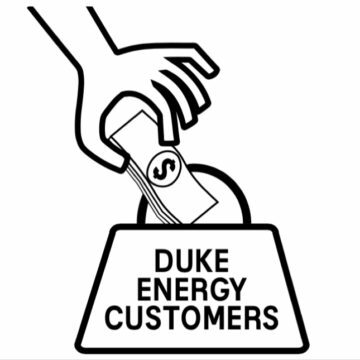 A key piece of Duke’s proposal is to triple the hidden mandatory monthly fee that customers must pay no matter how much or how little energy they use. Currently Duke customers pay about $8-9 per month for this hidden mandatory “Basic Facilities Charge,” but Duke is proposing to raise it to $28-29 per month, which means that customers would have to pay at least $336 per year before even flipping on a light switch. If approved, this would be the highest mandatory monthly fee of any investor-owned utility in the nation! Please read on to find out why this fee hike is bad for customers and what you can do to fight it! Why Do Mandatory Fees Hurt Customers? 1. Mandatory fees take away customer control – Normally, an electricity customer can control their bill by controlling how much power they use. Less power use equals a lower bill, and if customers are smart and thrifty they are rewarded every month with a lower bill. A high mandatory fee throws this opportunity for savings out the window and severely limits a customer’s choice and freedom to control their energy costs and lower their energy bills. 2. Mandatory fees place the heaviest burden on seniors and low-income customers – The customers that will be the most affected by this fee hike will be customers who use the least energy–often vulnerable communities including seniors and low-income citizens–who can least afford the costly changes. The average social security check in South Carolina is $1,417, which is already spread too thin between rent, transportation, medical bills, and prescription costs. It is just plain backwards to charge more to customers who use less. See the fact sheet here about Duke’s proposed fee hike, why it’s bad for customers, and how we can fight the fees. Please share this fact sheet with your friends, family, and networks. 3. Mandatory fees punish energy conservation and solar energy – High mandatory fees reduce the payback of investments customers have made in saving energy through measures like replacing light bulbs, insulating their homes, or installing solar panels. People who have done all the right things to save energy will actually be punished, rather than rewarded, and customers will have less incentive to save energy and capture the environmental benefits of energy conservation. 4. Mandatory fees keep customers chained to utility power – High mandatory fees rig the game in favor of the utilities by keeping customers chained to the power company since the incentive to use less energy is reduced. 5. Mandatory fees help shareholders, not customers – The purpose of increasing customers’ rates this much seems to be to help shareholders and executives with more revenues, rather than helping customers. Duke made more than $3 billion in profit in 2017 and paid their CEO $21 million–making her the highest paid utility CEO in the nation–while customers are left facing higher bills than ever. What Can You Do To Fight The Hidden Mandatory Fee? Duke’s proposed fee increase can be defeated if we speak up loudly in opposition! Before going into effect, the proposal must be approved by the SC Public Service Commission (PSC), so make sure that the PSC and your state legislators hear from you! Step 3: Write a letter to the editor of your local newspaper to help get the word out to others about this bad fee hike! See instructions here on how to submit a letter to the editor to most of the newspapers in South Carolina. That you are a Duke Energy customer. How you will be impacted by higher bills. How you have attempted to reduce your energy use through energy conservation, or how you want to reduce your energy bill in the future. Why you are opposed to increasing the hidden mandatory fee! Together, by speaking up loudly, we can defeat this outrageous fee proposal! Please share this blog post with your friends, family, and networks, and let’s work together for a fairer, cleaner energy system for us all.